bite me. sebastian black butler. HD Wallpaper and background images in the Black Butler (Тёмный дворецкий) club tagged: gothic black butler kuroshitsuji screencaps black butler phantomhive sebastian. 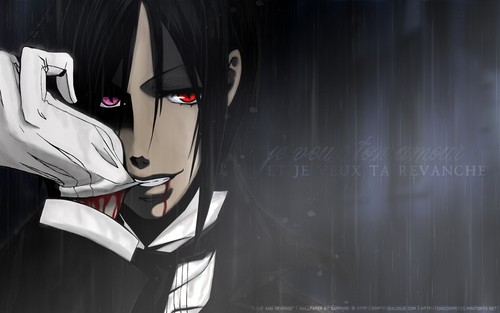 This Black Butler (Тёмный дворецкий) wallpaper might contain знак, плакат, текст, классной доски, and доске. "I will always be by your side, Young Master." Ты May Kiss The Bride.